With online marketing, more often than not we don't know where to start when facing an complex problems. But what if you aren't aware what the problem is? 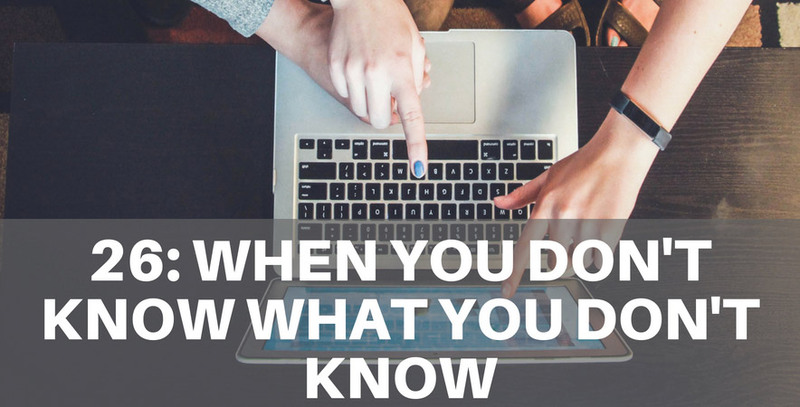 In today's episode we talk about what to do when you don't know what you don't know. Edmund: hey Darryl How are you? Darryl: Do you get what I mean brother? Darryl: Guy’s gal girl yeah you get that analytics girl in periodically to make sure that you're on track to give you that experienced inside hey I've got it I'm checking the basics I'm checking that the format of some particular content we're putting up I'm checking ad campaigns properly but I really wanna now go back and yeah what am I missing what what am I not seeing again what don't what do I not know I don't know it might be six monthly it might be annually just to stay on track right? Darryl: what other types of things do you think people could do what are what other areas are people? Edmund: well I think I think well we've talked about you know a generalist approach to your website whether it's functioning correctly we've sort of talked about SEO broadly you know of the technical issues on a website whether it's ranking whether it's getting found all those sorts of stuff we talked about analytics and we've talked about paid traffic I mean each of these areas allows you to dig in in more detail to like even in the SEO space there are experts at things like link building promotion do you know what I mean and so if you're a business that has paid an SEO in the past to do things like link building then yet certainly if your results aren't there any more you can get another expert to review your link building and promotional strategy to see whether it's you know being effective I mean that's certainly one opportunity for people and the other big opportunity is around content Darryl what do you think? Edmund: absolutely wonderful and that's it for today what do you reckon? 37: What happened with SSL?